Hello everyone! Recently the weather has been very cloudy, rainy, and quite cold for a Tennessee May and June. I like to call this a sort of transition time between spring and summer, so I wanted to come up with a look perfect for this type of weather. 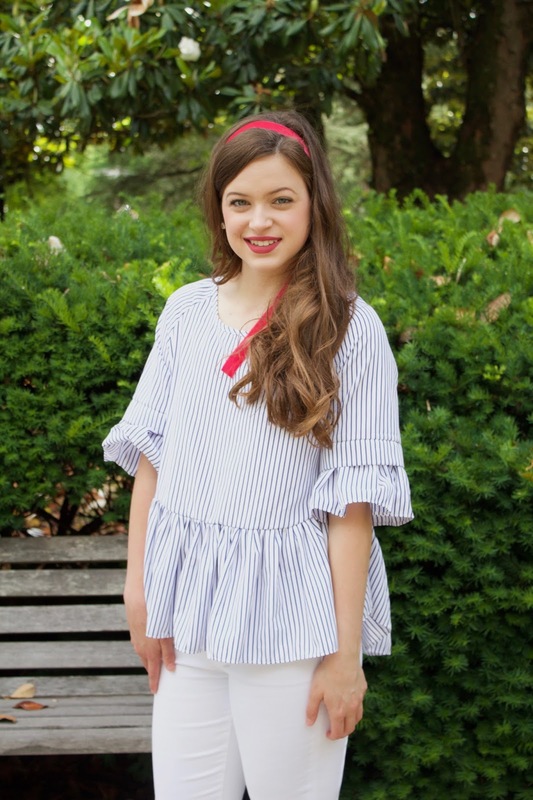 I came up with this ribbon-tied and ruffle look perfect for weather that is still a bit chillier than summer. I wore this the other day shopping after it had stormed all day, and it kept me warm but was also airy enough to make it perfect for the humidity and the rising temps. And best of all, it's tied with ribbons! 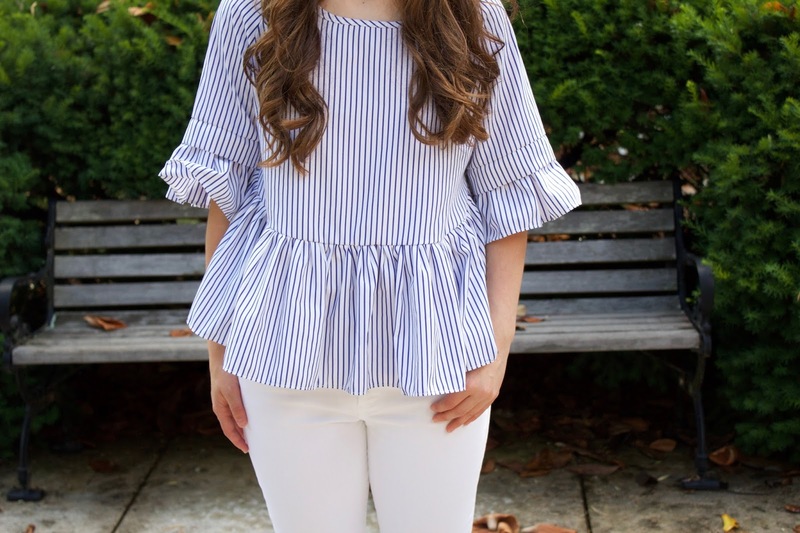 This top from Shein (originally purchased at Romwe) is no longer available in the blue and white stripe but they now have some adorable color combinations and even solids. 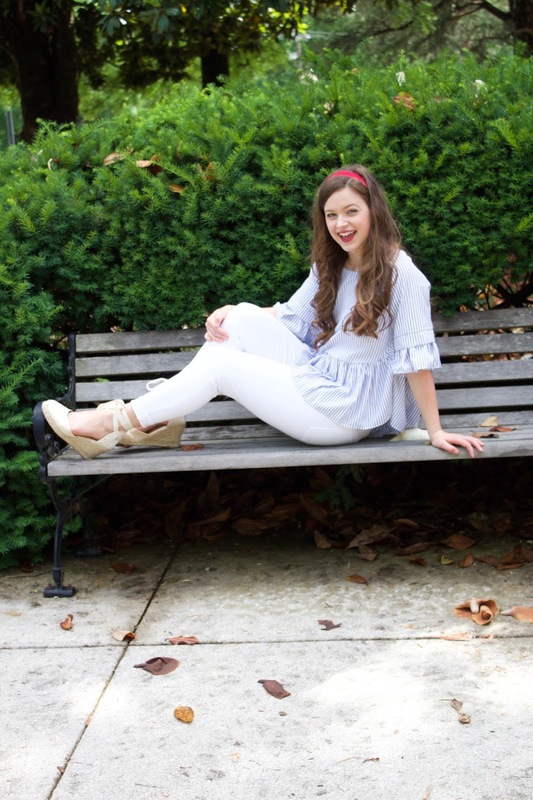 I love this top and think it's perfect paired with white jeans and a pop of color (a la the headband today) As you know I am also obsessed with ruffles, and this shirt represents that love very well! 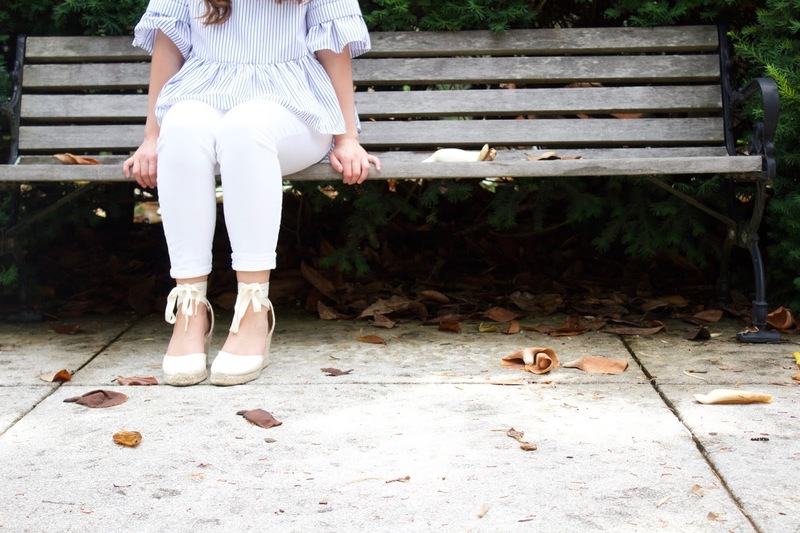 As you all probably know by now, I have been living in these soludos espadrilles that are so adorable! I have received so many compliments on these and they are so incredibly comfortable! Highly recommend. 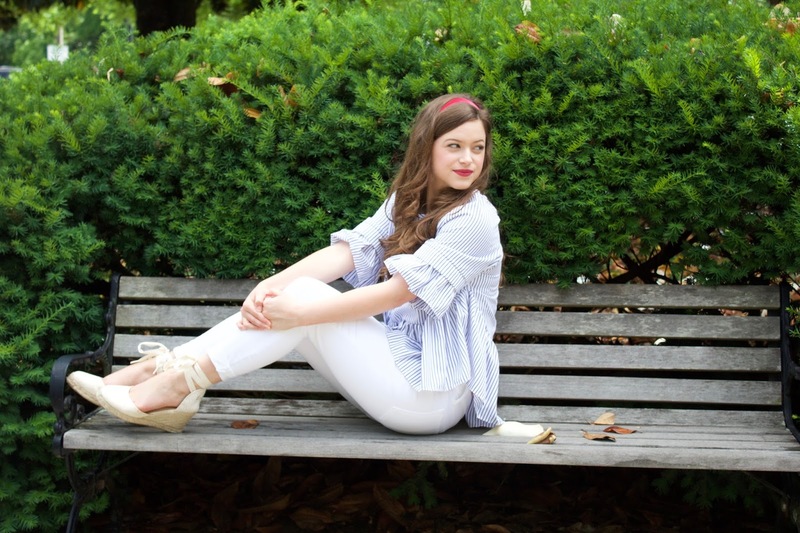 I also have been obsessed with the combination of white jeans and flowy tops- I love the look and think it's perfect for the early days of summer. I love headbands, so recently I tried out tying a ribbon in similar fashion to wearing a headband. This one is a hot pink and velvet ribbon that I purchased for about $2 at Hobby Lobby. This is such a great DIY and you can buy this in an array of colors at any craft store. Thank you for reading! 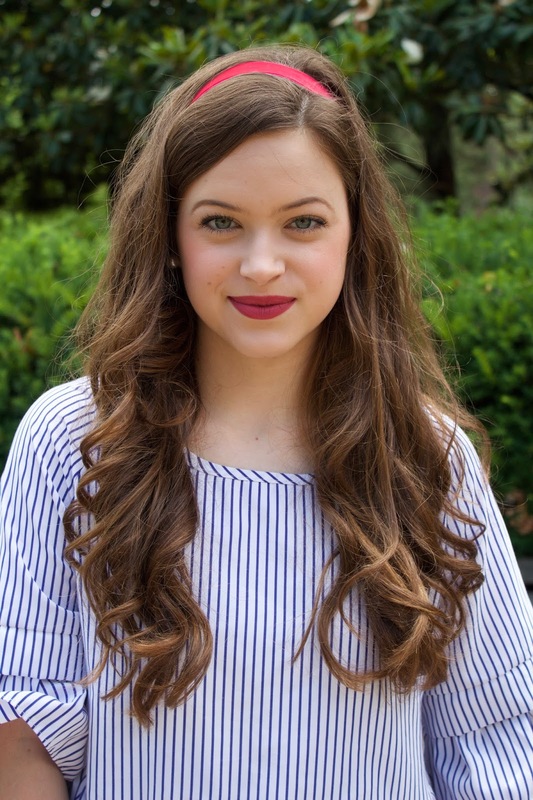 I hope you enjoyed this ribbon-tied and ruffle look perfect for that in-between spring and summer weather that I dread. 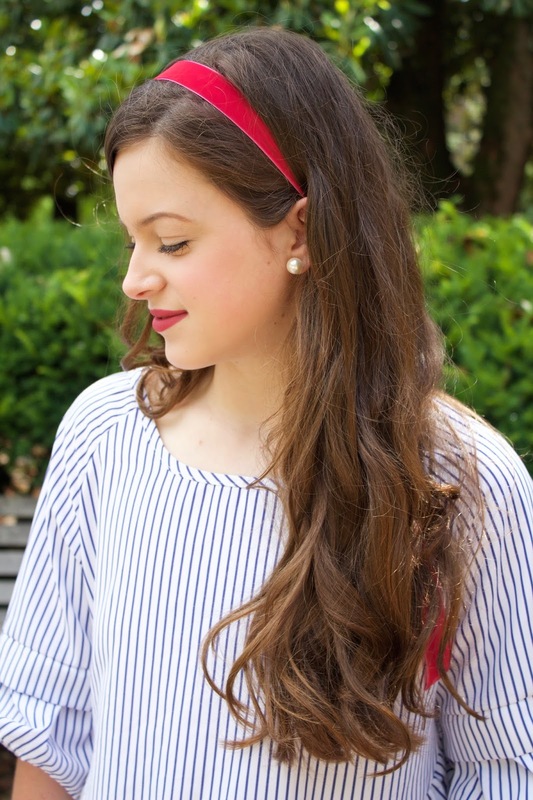 This look can cheer up the rainy days and make the wait for summer even more worthwhile!